In 2008, the folks who advise Americans about vaccinations, the Advisory Committee on Immunization Practices, added another shot to the must-have list of immunizations for older adults. Why is it so important for older adults to get the vaccine? Because the infection occurs so frequently in this age group; it’s also unbelievably painful and uncomfortable, according to patient reports. Some people say the pain is so excruciating it’s comparable to giving birth or having kidney stones. Unfortunately, having such intense pain over a long period – shingles usually lasts from two to four weeks – can also lead to other issues, such as depression, anxiety and loss of appetite. The shingles vaccine is available via prescription by a doctor and given in a single dose – usually in a doctor’s office or at a pharmacy. The drug used to inoculate against shingles is called Zostavax®; it’s the only such vaccine currently approved for use in the United States. The vaccine isn’t recommended for people ages 59 or younger, simply because if you get the shot too early, protection from shingles may not last into later life when you need it most. A condition called postherpetic neuralgia (PHN), caused by viral damage to nerve cells, can sometimes follow an episode of shingles. This condition can also be prevented in many people by getting the shingles vaccine. Studies show getting the shingles vaccine reduces your risk of developing shingles by 51 percent and post-herpetic neuralgia (PHN) by 67 percent. Talk with your SoFHA physician as soon as possible if you’re in the 60-and-older age group and haven’t yet received your one-time shingles vaccination. Want to know more? 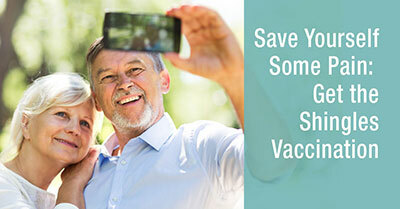 Read “Shingles Vaccination: What Everyone Should Know” posted on the Centers for Disease Control and Prevention website.